Over the last 25 years, thanks partly to a coordinated global effort to fight infectious diseases, including malaria, tuberculosis (TB), HIV/AIDS, and polio, childhood mortality rates have been reduced by 50%, and average life expectancy has increased by more than six years. Moreover, the share of the world’s population living in extreme poverty has been halved. These are major achievements, but they have brought a new set of challenges that must urgently be addressed. As lives have gotten longer and lifestyles have changed, non-communicable diseases (NCDs) like diabetes, cardiovascular disease, cancer, and respiratory ailments have taken hold, becoming far and away the world’s leading causes of death. While about 3.2 million people died from malaria, TB, or HIV/AIDS in 2014, more than 38 million died from NCDs. And the death toll continues to rise. Consider diabetes, one of the fastest-growing NCDs. According to a recent World Health Organization report , diabetes killed 1.5 million people in 2012, about the same number as TB. 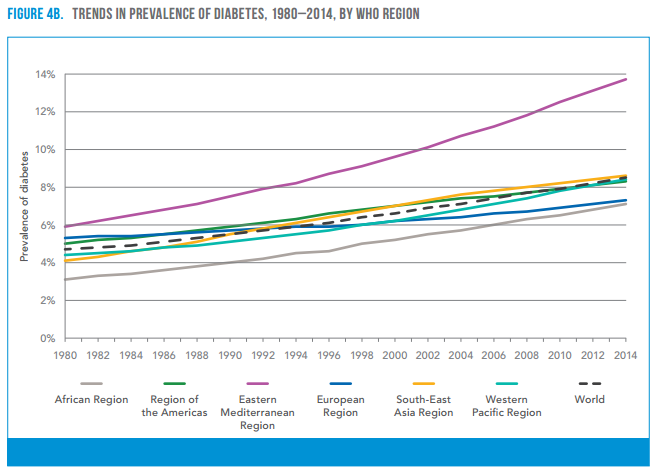 But while TB deaths have declined by half since 1990, the impact of diabetes is rising fast. In 1980, 108 million people were living with diabetes, a rate of about one person in 20; today, more than 400 million, or one in 12, have the disease. Contrary to popular perception of NCDs as diseases of the affluent, they disproportionately affect the poor in countries at all stages of economic development, but especially low- and middle-income countries. Indeed, according to the WHO report, more than 80% of diabetes-related deaths occur outside the high-income countries. One reason for this is that type 2 diabetes, the more common variant, is associated with lifestyle factors, such as inactivity, obesity, poor diet, and smoking, that are often more common among the less affluent. Making matters worse, in poorer communities, tools and medicines to diagnose and treat diabetes are scarce and often priced beyond people’s means. A recent study authored by PATH, with support from Novo Nordisk, showed that, in some cases, just one-third of public health facilities had insulin in stock, and only one in four had testing strips available to monitor diabetes. In Ghana, 15 days’ wages pays for a 30-day supply of just two of the drugs needed to prevent complications. These failings mean that almost half of diabetes cases outside wealthy countries are undiagnosed or inadequately managed. This has significant human and economic consequences. Diabetes requires lifelong treatment, and the earlier it is detected and care begins, the better the outcome. Untreated, diabetes causes conditions that make it impossible to work and often lead to early death. What will it take to ensure that people have the tools and medicines to diagnose, treat, and monitor diabetes? For starters, policymakers and donors must acknowledge the disproportionate impact of diabetes on poor communities and focus greater attention and funding on prevention and treatment. Prevention programs that promote healthier diets and exercise can lower the prevalence of type 2 diabetes and reduce complications for those who have the disease. And investment in health-care systems in low- and middle-income countries can help them to adapt to the increasing burden of lifelong diseases such as diabetes. The cost issue, too, must urgently be addressed. We must tackle deficiencies in distribution systems that limit access to drugs and diagnostics, driving up costs. This will require better forecasting, planning, and distribution; more effective negotiation of prices; and limits on markups. Moreover, we must invest in research and development of low-cost diabetes treatments and diagnostic tools that are suited for low-resource environments. Smart collaborative projects that bring innovative thinkers from nonprofits, academia, and the private sector together to create effective, affordable, and appropriate solutions are desperately needed. Unless we take action, the crisis will only become more serious. The WHO expects that, from 2010 to 2020, deaths from NCDs will grow by 15%, with the majority occurring in low- and middle- income countries. Today, just 1% of global health financing goes to NCD-related programs. This must change – and fast. Otherwise, the remarkable gains made in improving global health in the last 25 years will be overwhelmed by a rising tide of people who suffer and die from chronic diseases that we know how to prevent and treat.